If you own a 4×4 quad or UTV you want a tire that will work for multiple terrains, an all-terrain tire with the capability to tackle the wet season would be ideal. We’re not talking large-lugged mud tires; rather, smaller lugs with enough channels to push water aside and keep the traction moving in the right direction—tires that can deal with soft conditions but cross over to hard dirt as well. There are many ATV and UTV tire brands to choose from. Tires that range from basic tread patterns to run-flats. If you go shopping without narrowing them down, you might have better luck filling a wall full of tire pictures and throwing darts to see which one you land on. Don’t worry, Dirt Wheels has comprised a list of favorite all-terrain tires that can tackle the wet stuff. The AMS Radial Pro has a radial casing for a smooth, consistent ride. With the design of the tire lugs, this tire is an all-terrain tire that can tackle any condition you throw at it. The aggressive tread pattern can tackle mud, rocks, hardpack, sand and trails with ease. The Radial Pro also has a built-in rim guard that makes the rim sit recessed inside the tire for wheel protection. It has deep-enough channels to clean out in deep mud. Each tire weighs around 20 pounds, or a bit more for the bigger sizes. The AMS Radial Pro comes in 245/50-12, 23×10-14, 25×8-12, 25×10-12, 26×9-12, 26×11-12, 26×9-14, 26×11-14, 28×10-14 and 30×10-14 sizes. The Arisun Gear Buster is designed for those who like to traverse boulders, dirt or the wettest conditions there is. The rubber compound produces grip to pull you out of the gnarliest spots. This non-directional tire features an eight-ply construction with deep voids and large lugs. Aramid-reinforced composite material sandwiched between two layers of nylon helps prevent punctures, abrasions and cuts. Even though this tire is an eight-ply, it’s still lightweight. The Arisun Gear Buster comes in 26×10-12, 26×11-14, 28×10-14, 30×10-14 and 30×10-15 sizes. The BFGoodrich Baja T/A KR2 UTV tire is engineered with race-proven CoreGard technology. This is the first UTV tire produced by BFGoodrich and is specifically designed for the performance of a UTV. The Baja claims great performance and increased mobility in soft soils, enhanced traction in mud, and great braking in loose and rocky soil. This tire has roots in the Baja-winning truck tire line, so it’s tough. Its three-ply construction keeps it on the light side for a 30-inch tire. Raised bars in the shoulder tread area help to release mud for better traction. The staggered shoulder blocks also provide improved traction and braking performance in soft terrain. Each tire weighs 37 pounds. The BFGoodrich Baja T/A KR2-UTV tire only comes in 30×9.5-15. BKT’s W 207 is an all-terrain tire that is suitable for ATVs and UTVs. It’s designed to provide traction in all conditions. It has a classic chevron-style pattern that works in wet conditions or mud, with large channels to clean out the mud and side lugs to provide side bite. This tire is rated E, so it can be driven on the street legally in the U.S. Its six-ply rating gives it puncture resistance in any terrain while maintaining a lightweight carcass. The BKT W 207 comes in 22×11-8, 22×11-9, 25×12-9, 25×13-9, 22×11-10, 22×7-10, 22×8-10, 23×10-10, 23×7-10, 23×8-10, 23×10-10, 23×7-10, 23×8-10, 24×11-10, 25×11-10, 25×12-10, 23×8-11, 24×10-11, 24×8-11, 24×9-11, 25×10-11, 25×8-11, 24×8-12, 25×10-12, 25×11-12, 25x8R12, 26×10-12, 26×12-12, 26×8-12, 27×10-12, 27×12-12, 28×10-12 and 28×12-12 sizes. 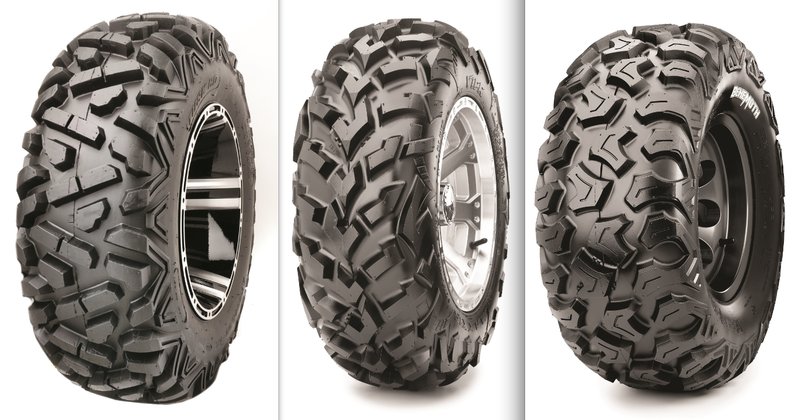 The CST Behemoth is a utility ATV and UTV tire that features an aggressive tread pattern for grip, while accelerating and large shoulder treads for predictability in ruts. It’s made with radial construction that is lightweight and has low rolling resistance in hardpack conditions, helps at high speeds and adds confidence in the mud. The Behemoth is eight-plyrated that will help with punctures and can handle heavy cargo loads. It has large channels that push away mud and water so you can keep digging yourself out of a hairy situation. The CST Behemoth comes in 25×10-12, 25×8-12, 26×11-12, 26×11-14, 26×9-12, 26×9-14, 27×11-12, 27×11-14, 27×9-12, 27×11-14, 27×9-12, 27×9-14, 28×10-14, 28×10-15, 30×10-14 and 30×10-15 sizes. The Duro Buffalo lives up to its name by being a great all-terrain animal of a tire. It has medium-sized lugs that help it grip in mud yet works as an all-terrain as well. The aggressive V-shape design helps with mud and water evacuation while retaining traction. With its four- or six-ply-rated carcass, it aids traction by working to stiffen the tire and adding puncture resistance. Each tire weighs anywhere from 16.4 pounds to 41.7 pounds depending on size. The Duro Buffalo comes in 25×10-10, 25×11-10, 25×12-10, 23×8-11, 24×8-11, 24×9-11, 24×10-11, 24×8-12, 24×11-12, 25×8-12, 25×10-12, 26×8-12, 26×11-12, 27×10-12, 27×12-12, 28×10-12, 28×12-12, 26×8-14, 26×9-14, 26×10-14 and 26×11-14. The DWT Moapa run-flat tire is a 12-ply tire that can be driven with 0 psi for 50 miles at 40 mph—that is, if you manage to punch a hole in this tire. Even at 0 air pressure, it looks like it has air in it and performs like it too. The Moapa has a wide contact patch that gives it great traction on dirt, pavement or mud. Its shouldered tread design gives it traction in corners. The multi-directional tread pattern works whether you’re in reverse or forward. Along with this tire’s capabilities, you won’t have to worry about carrying a cumbersome spare tire. These tires do weigh more than most on this list, anywhere from 28 pounds to 48.5 pounds. The DWT Moapa run-flat comes in 25×8-12, 25-10-12, 26×9-14, 26x11x12, 26×11-14, 26×9-12, 28×10-14 and 28×12-14. They are also available in a non-run-flat design. GBC’s Grim Reaper tire combines an aggressive skeletal tread with deep, wrap-around shoulder lugs to give great rubber-to-ground contact at several angles. The design of the Grim Reaper helps it corner well, and the radial design gives it a smooth ride. This all-terrain works great on gravel roads to mud, with large channels to move the water away from the lugs. The Reaper has an eight-ply rating and great puncture resistance. Each of these tires weighs from 19 pounds on up for the bigger sizes. The GBC Grim Reaper comes in 23×8-12, 23×10-12, 25×8-12, 25×10-12, 26×10-12, 26×12-12, 26×9-14, 26×11-14, 27×9-14 and 27×11-14. The Goldspeed MXU is its newest tire—a six-ply tire designed to be the lightest utility tire on the market, starting at only 17 pounds. It is constructed with Goldspeed’s Puncture-Proof Material (PPM), providing protection against flats. The MXU was designed with GNCC racing in mind so it can handle any condition, including deep mud holes. It has medium-sized lugs and deep channels to drive the mud away from the tire. The Goldspeed MXU comes in 25×8-12, 25×10-12, 26×912 and 26×11-12. The GMZ Slammer tire is a great all-terrain tire that is proven in many conditions, including snow. This tire is a good choice for OE replacement, yet does well in race conditions. With sixply radial construction and a unique blend of rubber compounds, it has a comfortable ride and offers puncture resistance. The Slammer has 3/4-inch-tall tread blocks and features a knurling on the shoulder lugs of the tire to deliver traction in corners or ruts. These tires weigh between 26.6 pounds and 27.8 pounds depending on tire size. The GMZ Slammer tire comes in 26×9-12, 26×11-12, 27×9-14 and 27×11-14. ITP’s Black Water Evolution is a non-directional, eight-ply tire that provides traction in any situation, including mud. Large channels allow the tire to keep the mud off and keep the traction flowing. Its Tough Tread rubber compound offers great wear and abrasion resistance for extended tire life. ITP’s Sidewall Armor protects the shoulder area from penetration, which increases reliability. This radial boasts a comfortable ride as well. Each tire weighs between 25.4 pounds and 39.9 pounds. The ITP Black Water Evolution comes in 25×9-12, 25×11-12, 26×9-12, 26×11-12, 27×9-12, 27×11-12, 27×9-14, 27×11-14, 28×10-12, 28×9-14, 28×10-14, 28×11-14, 30×10-12, 30×10-14, 30×10-15, 32×10-15 and 34×10-17. The Kenda Bearclaw HTR is an eight-ply radial casing structure design that is great for all surfaces. Pro riders and drivers in XC racing love this tire, as it works well in deep mud or on rocky terrain. A center knob design provides low vibration and a smooth ride. The tall knobs dig into the dirt and mud, but are spaced far enough apart to self-clean and push dirt aside efficiently. The eightply carcass helps prevent punctures yet keeps it on the lighter side. The Kenda Bearclaw HTR comes in 25×812, 25×10-12, 26×9-12, 26×11-12, 27×912, 27×11-12, 26×9-14, 26×11-14, 28×9-14 and 28×11-14. The Maxxis VIPR is a six-ply radial tire that is built for a smooth ride and performance. The directional tread of the VIPR offers deep lugs with a large contact patch. With deep lugs, that means you get traction that excels in all terrain, mud included. The VIPR also has a rim guard that protects the rim from harm. Channels keep the mud off of the tire, which helps with traction. This tire excels in desert, intermediate terrain, mud, soft terrain and rocky terrain, making it a true all-terrain tire. Each tire weighs around 30 pounds. The Maxxis VIPR comes in 25×8-12, 25×10-12, 26×9-12, 26×11-12, 27×9-14 and 27×11-14. Moose Racing’s new MUD (Moose Utility Division) Switchback tire has a classic, aggressive tread design that works great on a full range of terrain—from muddy/wet conditions to hardpack. The tread pattern has a wide footprint that provides traction, along with cleaning out the mud very well with deep channels. Wide shoulder lugs protect the sidewall and give great side bite through ruts or corners. The 23-inch through 27-inch tires are six-ply-rated, while the 28-inch and 30-inch versions are eight-ply-rated. The Moose MUD Switchback comes in 25×11-9, 25×12-9, 25×11-10, 23×8-11, 24×9-11, 24×8-12, 25×8-12, 25×10-12, 26×9-12, 26×10-12, 26×12-12, 27×9-14, 27×10-14, 27×11-14, 27×12-14, 28×10-14 and 30×10-14. anti-puncture, Kevlar triple, Armor Belt eight-ply design with four tread belts—three belts on the sidewall and four belts on the bead. This tire has 1-inch lugs that deliver traction in the most vigorous terrain, including mud, sand, dirt, loam, hardpack and pavement. These tires have great channeling capabilities to clean out the mud and water for optimum traction. The shoulder lugs give great side bite and traction in the mud. The Moto Race Tire Trail Pro comes in 26×9-14 and 26×11-14 sizes. The No Limit Patriot tire features a repeating, modern tread pattern for a fine ride quality. It’s constructed with an eight-ply carcass, which allows a higher load rating, longer tread life and puncture resistance. The lugs are nearly 1 inch tall on the Patriot. The non-directional tread provides performance, but is spaced well for ride quality and mud clean-out. These tires work well in the dry desert and in the wettest conditions Mother Nature can offer. Along with great puncture resistance, this eight-ply tire is light. The No Limit Patriot comes in 27×9-14, 27×11-14, 28x10x15 and 30×10-14. The Growler BG2.5 radial tires from Pit Bull are DOT-legal tires for your UTV and ATV. These tires feature large tread blocks with rounded edges to help reduce tire wear and noise, and staggered center lugs to increase traction. Integrated sidewall protectors and rim guards hold up to sidewall abrasions and cuts. Wide voids and sipes offer easy clean-out and reduce hydroplaning. These directional tires are great for mud, snow and rock trail conditions. The Growler 25-inch to 27-inch tires are offered as six-ply, and the 30-inch is an eight-ply carcass. The Pit Bull Growler BG2.5 comes in these sizes: 25×8-12, 25×10-12, 26×9-12, 26×11-12, 27×9-12, 27×11-12, 26×9-14, 26×11-14, 27×9-14, 27×11-14 and 30×10-14. The Pro Armor Attack is an eightply radial tire. It features aggressive, 1-inch-deep tread and great side-bite traction to provide your machine with great handling, grip and durability. These tires can handle racing, mud holes, gravel, hardpack, loam, sand and trails. The sidewall has a threeply rating, which helps with punctures and tire roll. It has mud-channeling capability that won’t allow the mud to stay on the tire for long. Each tire weighs 28 pounds for the front and 32 pounds for the rear. The Pro Armor Attack comes in the 26×9-14 size for the front and the rear. The RP Advanced SOF Series II run-flat tire is military-authorized and combat-proven. The 12-ply carcass allows the tire to be run at 40 mph for a total of 50 miles without air at 900 pounds of payload per tire. It has added bead-ring protection, reduces the need for mixed front and rear tire sizes, along with not needing to carry a spare tire. A wide contact patch gives it the right amount of traction for mud, sand, loam, hardpack, pavement, rocks and harsh obstacles. Its multi-directional tread and construction make this tire versatile. Each tire weighs 34.80 pounds for the front and 35.90 pounds for the rear. The RP Advanced SOF Series II run-flat tire comes in 26×9-12 and 26×9-14. Sedona’s Mud Rebel RT is an all-terrain radial tire that has a sixply rating. Heavy-duty radial directional construction offers stability and control, while its high-grade rubber compound brings great traction and tread-life wear. The 1-1/8-inch-deep lugs work great on mud, trails, hardpack, rocks and sand. This tire has great mud-channeling features that allow it to push the mud aside. The sidewall structure is designed for today’s larger-displacement ATVs and UTVs to get side-bite traction. The tires start at 22.70 pounds and weigh up to 34.70 pounds. The Sedona Mud Rebel RT comes in 25×8-12, 25×10-12, 26×9-12, 26×10-12, 26×11-12, 26×9-14, 26×11-14, 28×10-14 and 30×10-15. STI’s Black Diamond XTR is an all-season crossover tire with a sixply radial design that provides stability needed for UTV and ATV applications. This tire offers an extended-wear tread compound claimed to retain biting edges longer and increase tire life. The V-pattern bridges the gap between mud, snow, sand and hardpack surfaces. The 1 1/8inch tread depth offers traction, and this tire is DOT approved for legal pavement riding/driving. Each tire weighs between 22.7 pounds up to 34.5 pounds. The STI Black Diamond XTR comes in 25×8-12, 25×10-12, 26×912, 26×10-12, 26×11-12, 26×12-12, 27×912, 27×11-12, 26×9-14, 26×11-14, 27×914, 27×11-14, 28×10-14, 26×9-15 and 26×11-15. Tensor’s Regulator all-terrain tire has an eight-ply construction with a nylon reinforcement layer for great flat protection. It offers a steel-belted inner and outer bead that helps against sidewall failures. This DOTapproved tire is based on a truck tire design that performs well on all terrain. The wide footprint enhances handling and braking when you need it. It has deep tread lugs on the center and the shoulder for cornering traction. It has a 1,600-plus pound load rating and good puncture resistance. The Tensor Regulator tire comes in 28×10-12, 28×10-14, 30×10-14 and 30×10-15. Tusk’s Trilobite HD is one of the least expensive tires on this list. It offers a heavy-duty six-ply carcass for puncture resistance, and it’s lightweight. It offers a classic but aggressive tread pattern that is great for desert, dirt, rocks, mud, loam and snow applications. The Trilobite HD also has extra lugs on the shoulder to protect the sidewall and rim from getting damaged. Mud channels to the side of the tire for killer traction. These tires work on the UTVs and ATVs for any type of terrain you can put them through. The Tusk Trilobite HD tire comes in 25×812, 25×10-12, 26×9-12, 26×10-12, 27×9-14 and 27×11-14. The Vee Rubber Advantage is specifically designed for UTVs and ATVs. They’re tough, heavy-duty, six-ply-rated radial tires that resist center and sidewall punctures while providing great traction in its lug design. The tread pattern is designed for improved ride quality and handling characteristics. The wheel sits a bit recessed inside the tire thanks to Vee rim-saver bead technology. They’re also manufactured for greater weight-carrying capacity for the UTVs or utility ATVs. These tires are proven in XC racing that consists of rocks, roots, mud, sand, hardpack and pavement. The Vee Rubber Advantage comes in 25×9-12, 25×11-12, 26×10-12, 26×12-12, 26×9-14 and 26×11-14.